This article points out who the prime bull drivers for gold prices for the near term. Interesting to note that the potential for another gold-price correction may be driven but institutions rather than retail buyers as they try and plan their position in the new economy—whatever that may be. Gold is trading at USD 1,675.30, EUR 1,214.20, GBP 1,062.30, JPY 129,036.00, AUD 1,634.90 and CHF 1,503.70 per ounce. Gold’s London AM fix this morning was USD 1,676.00, GBP 1,062.31 and EUR 1,214.31 per ounce. 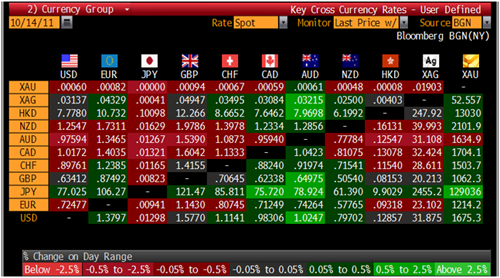 Yesterday’s AM fix was USD 1,673.00, GBP 1,065.74 and EUR 1,218.05 per ounce. Gold is marginally higher in most currencies today and continues to consolidate at the upper end of the range between $1,600 and $1,700/oz. Physical demand for coins and bars remains very strong with GoldCore experiencing a notable increase in demand this week. Gold is up nearly 3% on the week and looks set to post its biggest weekly gain in more than a month. Markets remain nervous about the risk of contagion ahead of a G20 meeting whose agenda will be dominated by the euro zone debt crisis and steps to tackle the contagion. Gold should be supported by global inflation data this morning which remains stubbornly high particularly in emerging markets. Inflation in China and India remains very high. In India, inflation exceeded 9% for the 10th month in a row and in China inflation is at 6.1% but the key food component of inflation rose 13.4% year-on-year in September. European inflation accelerated the fastest in almost three years in September on soaring energy costs, complicating the European Central Bank’s task as it combats the region’s sovereign-debt crisis. The euro-area inflation rate jumped to 3 percent last month from 2.5 percent in August. Inflation in Germany also surprised to the upside this week. The Bloomberg ‘Chart of the Day’ shows the proportion of gold in the international reserves of India, Russia, China and Mexico is significantly lower than the rates in the U.S., Germany and France, based on data compiled from the World Gold Council. The lower panel tracks central bank holdings in metric tons and the bullion price since March 2008. 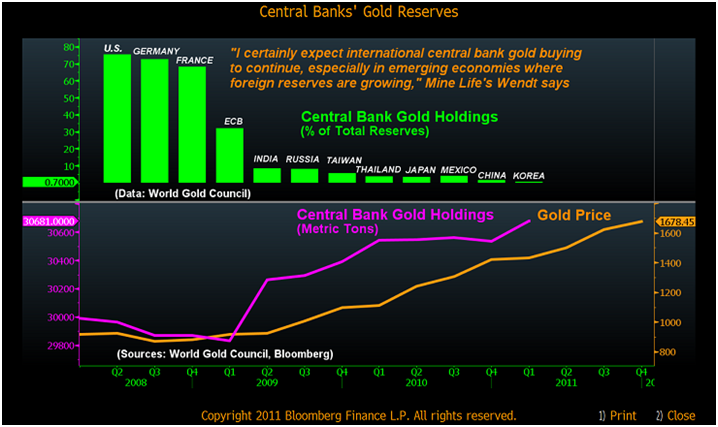 Central banks last year were net gold purchasers for the first time in two decades. I simply envy the way you are able to mix and match so many facets of life and business all into your posts and lead the reader up a path that is bound to get them the results that they need. I hate to harp on this, but I continue to see some exhaustion on the charts and additional downside moves ahead of us, especially if the S&P 500 April low of 1,294 is not reached. Personally I see another major crash between January and February. Seems to me the real story is European, Middle Eastern and Asian retail physical metal buying driving gold higher. Central banks buying surely helps in the market while the pounding of gold and silver prices through the paper forward & futures market is causing real shortages of physical metal.